Fresh Paint – Free Joel! Since December 2013 Joel serves his sentence in swedish prison. He still raises his voice – he still did the right thing! Antifascist selfdefense, for equality & a better world, respect for this brother! Solidarity is our weapon – support the prisoners & burn down all prisons! 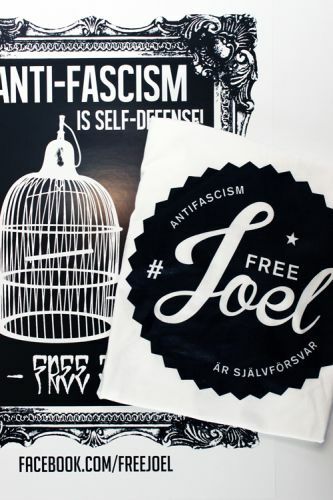 We produced a little solidarity-package including a shirt (♂ / ♀) and a poster for you to support our comrade Joel, who is captured by the swedish state. The benefits will be forwarded to the Free Joel solidarity structure in Sweden. Joel is in prison, sentenced to 5 years and 6 months, for defending a local community-organized anti-racist demonstration in the Kärrtorp area of Stockholm against a brutal nazi-attack on the 15th of December. Joel got arrested by the police a few days later altough the anti-fascists did nothing but defend themselves. Altough the left-wing people of Stockholm showed strength afterwards, Joel and his comrades still need your solidarity, your solidarity-actions and your letters to our imprisoned comrade. FREE JOEL! FREE ALL POLITICAL PRISONERS! Du browst gerade in den Fire and Flames Weblog-Archiven nach dem Tag 'free-joel'.